Join my readers group by filling in this form. I will not 'spam' you nor share your email address with anyone. Occasionally I will share news about my writing. This classic Danish sloop, a fiberglass double-ender (Sagitta-30) is where I started writing The UnFolding on my summer vacations back when I was teaching in the 'lower 48'. 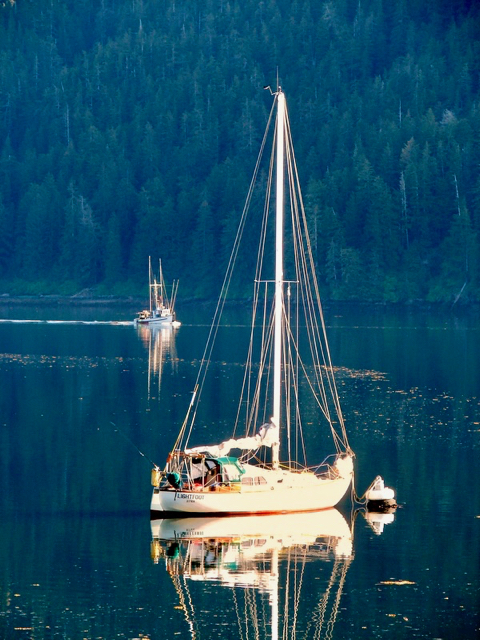 She is shown tied to the US Forest Service Neva Strait mooring buoy, about 20 miles north of Sitka, Alaska. I was ashore on Partofshikof Island looking across the strait. The commercial fishing boat in the background is a typical older wooden troller that catch wild salmon in these waters. It is not often sunny and warm up here but when it is it is glorious!